Where Are My Flying Cars and Hover Boards? Last weekend, the kids watched Back to the Future for the first time. I saw that film when it was in theatres back in 1985 and about ten times since, and it was fun experiencing it through their eyes. Although I loved Back to the Future, I had never seen either of the sequels until tonight. Tonight I sat down with the kids to watch Back to the Future II, a movie I've avoided for 22 years. It was a little unsettling. 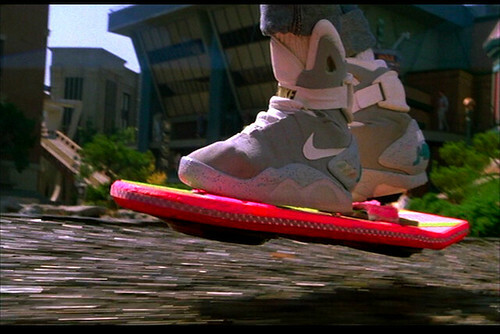 There are scenes that take place in 2015, and there are flying cars everywhere and kids are riding hover boards. 2015 may have seemed like the distant future back in 1989, but from where I'm sitting, it's only a few years away. There's no way we'll have flying cars everywhere and hover boards in 2015. Can't your friends at Ford loan you a Hover-car? Screw the Lincoln Hybrid! Those cars operated on garbage. Talk about green! And the hoverboard would have been cool. +1 for the hoverboard. MAAAN I wanted one so bad. Looks like it isn't going to happen before 2015 though.